It was so beautiful to be there, treading water, waiting for our wave to start, surrounded by my idols, those who inspired me to chase my dream. Paralympians like Liz Baker, Aaron Scheidies, Hailey Danza and so many others. This was my second time at the US Paratriathlon National Championships, and it was by far the most enjoyable! I was very proud to have Alison Lynch by my side, another Achilles athlete, she has been training with me for a year and seeing her racing at Nationals was very moving. Last year I finished 13 minutes behind Aaron Scheidies (5 times world champion), my goal was to be a little closer this time. My wave started shortly after the Star-Spangled Banner, it was nice to swim in a beautiful lake, a little cleaner than the Hudson River. I pushed hard, I counted my strokes, I knew right away that it would be a good day. The bike course was flat, slightly windy, my guide Thomas was on a mission. 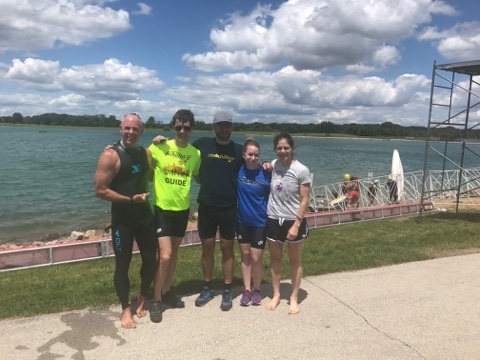 Dare to Tri (a great paratriathlon club based in Chicago) let us use one of their beautiful tandems, we averaged 24 Mph, it was exhilarating. My hard work at Tailwind Endurance during the winter finally paid off! I started the run at a 6:40 pace, slightly faster than I anticipated. Thomas told me to slow down a little, it was a smart move. We passed many paratriathletes, they were all very supportive, what an incredible community. Two wheelchair athletes, Kendall Gretsch and Ahalya Lettenberger passed us around mile two, they were neck to neck and finished within 10 seconds of each other. It was fun to follow this race within the race! Thank you, Thomas, for your funny commentaries, it took my mind off the pain for a few seconds. The last mile was rough, my breathing was out of control. I kept thinking of what my running coach Stefan always says, a sprint triathlon is a long journey in the hurt locker. It is supposed to be painful! I finished strong, with a new PR of 1:14:04, 1st place in my Age Group, 2nd place in my category. Aaron, of course, won, as always, but I was a little closer this time. It was fun to chase him around. I’ll be back mon ami. I am now getting ready for the NYC Triathlon in July and the French Championships in September. I still have a lot of work to do! Being the second fastest blind triathlete in the country is a great accomplishment, but it is not the end of my journey.